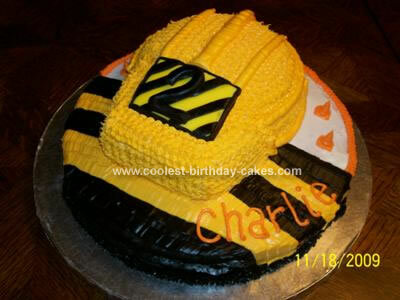 I made this Construction Hard Hat Cake for one of my daycare kids. I used a large round for the bottom layer (cherry chip flavor), and a baking bowl and extra cake piece to make the hard hat. I used fondant to make the number 2 plack for the hat. My favorite part are the little orange cones made with butter cream icing.